Would you like to take yoga classes in an inspiring environment whereby we help you to take care of your body, mind and heart and re-energize? Subscribe yourself to 2 try out classes for only €15. 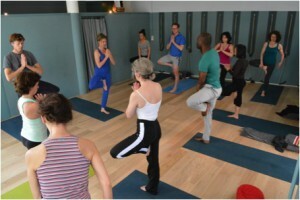 *Offer including all classes except workshops, pregnancy classes and retreats. Vijnana Yoga Vijnana yoga is based on the idea of ‘practicing from the inside’. A lot of attention is paid to influence the breath (pranayama). There is a strong focus on the centre (core) of the body. Vijnana yoga will help develop a strong body, a conscious yoga practice and a stable, focused mind. Vijnana is developed by Orit Sen Gupta and is based on 7 vital principles. At Samana many classes are in the Vijnana Yoga tradition. Sanne Kerkhof and Eveline Torres, owners of Samana yoga center Amsterdam, are trained in this tradition. Be aware of inhaling, of exhaling. Inhale – go deep within; exhale – connect to the world. Inhale – accept what is; exhale – give yourself to the earth. Inhale along the body, exhale and root. Inhale and connect the farthest parts, exhale and move into the final pose. While inhaling the body elongates and widens, while exhaling it steadies itself in rooting and connecting. At times the breath is sweet and soft, at times it is deep and long. Sometimes the exhalation lasts longer than the inhalation, sometimes it is short and decisive. At times only in the background, at times the source of action, breath is always present. When there is rooting while exhaling, inhaling brings about elongation and widening. Or perhaps the elongating and widening, that occur as a result of rooting, allow for inhalation. When elongating and widening occur, not one ring touches another as the chain called body moves in space. Then there is no sagging into the joints, no effort in the muscles. The skeleton shields its coverings; the coverings create space for the skeleton. Thus the body moves about – relaxed and connected – one.